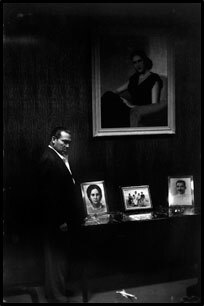 On every assignment, whether a news story like that which carried him to Cuba just before Batista's fall from power in 1959 or Liz Taylor's triumph at the 1961 Oscar awards--Grey Villet immersed himself fully in the moment. "In order to understand and reveal what is happening," he once remarked "the photographer must participate. He has to FEEL what is going on by photographing it...be involved when he presses the shutter so that the moment he has captured means something to him...his ultimate goal: to allow a series of photographs to truly reveal a segment of the human dilemma with honesty and compassion to say 'this is what is is all about,' this is what we are all striving for-pictures that can stand alone. " Left: 1958 Cuba, tA brooding image of Batista suggests his foreknowledge of his future. 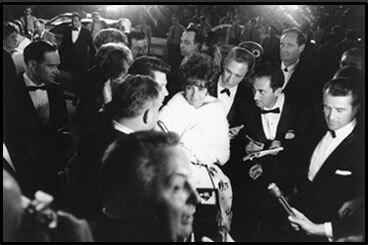 Right 1961 Oscar night Liz Taylor basks in fame, --Villet's image of Taylor was less about her than about the impact of stardom on those who live in its shadow.